Faust Robert Cruz obituary. Carnes Funeral Home. 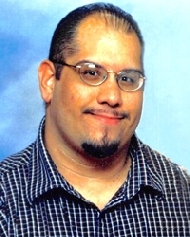 A loving son, brother and uncle, Faust Robert Cruz, 39, of El Paso, TX, passed away June 28, 2017. Robert was born in Roswell, New Mexico to Fausto and Julia (Foster) Cruz on June 22, 1978. He attended Western Technical School and specialized in Automotive Mechanics. He also attended New Mexico State University and transferred to the University of Texas at El Paso and majored in Mechanical Engineering. He enjoyed building and repairing cars and electronics. He never hesitated to lend a helping hand when someone was in need of help fixing their cars and computers. Robert had many hobbies and talents which he shared with his family and friends. Robert enjoyed cooking and grilling for his loved ones. Robert was an amazing artist particularly drawing portraits. He was a huge movie collector and appreciated music. Robert especially thrived on the challenge of perfecting his sound system so everyone could enjoy the bass. He was intelligent, ambitious, a motivator, had a great sense of humor, and was very loving. Robert is preceded in death by his grandparents Wilfred Foster, Muriel H. Foster, Albert Cruz; and one brother Christopher Cruz. Robert will be forever in the hearts of his parents Fausto and Julia Cruz, his brother Jonathan Cruz and, sisters Anna Flores, Kristina Blackmon, Angel Cruz, Julie Monarez, and Elizabeth Cruz. Robert will also be forever in the hearts of his three nieces, two nephews, extended family and friends. Guests are invited to share in an Evening Visitation from 5-8:00 p.m. on Friday, July 7, 2017 at Carnes Funeral Home, 3100 Gulf Freeway, Texas City, TX 77591. A Morning Visitation will be at 10:00 a.m. on Saturday, July 8, 2017 followed by a Celebration of Life Service at 11 a.m. with Reverend Jesse Garcia officiating.